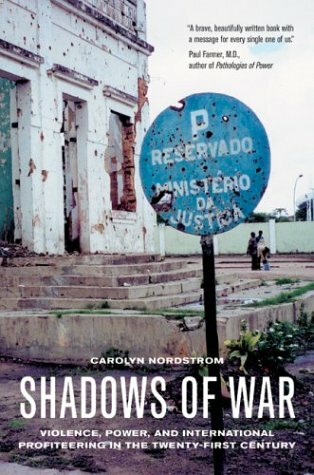 Norstrom’s task is to put together a meaningful tapestry of these relationships, including the relief pilots whose planes are commandeered by powerful businessmen to move private trade stocks; the bankers who assist in turning hard currency, used for sales of munitions, food, and medicine, into recognizable international curencies; and even 9-year old Angolan cigarette sellers, working on advance and commission. There is no hard and fast line, Nordstrom argues, between “legitimate” and “illegitimate” transactions, and the development of in/formal economies has in fact been crucial to the creation of stable state regimes. This kind of analysis recalls to us the more-than-one hundred repetitions of “So it goes…” in Vonnegut’s barely two hundred page text. “So it goes” is used for any death, or deaths, mentioned. This includes, of course, the 130,000 killed in a single night in the Dresden firebombing, to Billy Pilgrim’s wife Valencia’s asphyxiation on the way to the hospital after Billy has survived a plane crash, to the dead animals who grease the axles of the cart used by Billy and Edgar Derby after the Russians occupy Dresden. Written in Vonnegut’s sparse prose, all of the deaths are related in their qualities of absolute purposelessness, interdependence, and heart-wrenching fatalism. Vonnegut’s pure fatalism is buttressed by the classic portrayal of four-dimensional space-time that Billy Pilgrim learns from the Trafalmadorians. The Trafalmadorians do not experience time in a linear fashion, but all at once. This fatalism, then, is also a form of consolation, since any awful condition of a person co-exists with their happiness or peace at many other times, all of which exist (in the sense of being actually present events, not merely possible or remembered events) unchangingly. I surmise that one of the ideas conveyed in Slaughterhouse-Five is that War and Time have a kind of essential relationship or similarity. While I wouldn’t go so far as to suggest that War = Time, War nonetheless expresses an indistinctness that enables it to lay over and impinge every human experience in such a way that neither past nor future exist, only War itself, perpetually/infinitely. Or, put another way, war and peace are merely two connected parts of the human millipede, and can be viewed co-presently if correctly understood. After all my own investigations these many years, into politics, philosophy, history, religion, I doubt that I have much more to contribute than that. 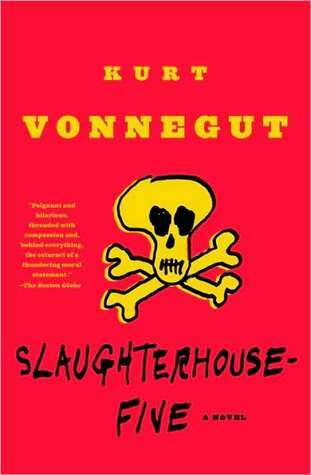 When the course begins, I will be thinking more about the relationship between War and Time in Slaughterhouse-Five, and perhaps the more interesting bits of this will show up here, later this spring.